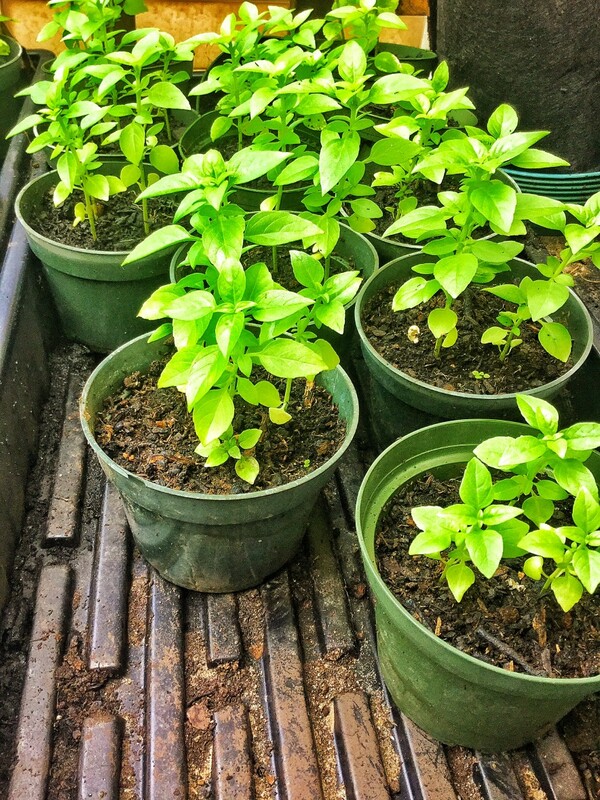 Getting your plants started may seem at first, a daunting process. But once you’ve taken that crucial, first step towards growing your own food, you may have gotten your basic materials together; pot, packet of seeds, and soil. You open your packet of seeds, bury some seeds in the soil, and water. Then you wait, and wait. I find this stage of gardening to be the most frustrating and the one most rewarding for the patient gardener. Sometimes you wait weeks and nothing appears, sometimes many seedlings poke their way out of the soil. However, when you’re starting out this whole process can seem like alchemy. If you are starting the seeds with the intent to transfer them outside, the process becomes even more confusing! I’ve had whole flats of thriving seedlings I’ve transplanted outside die within 2 days of transplanting. I’m pretty sure I’m not the only one who’s suffered through these trials getting your plants started. I had limited success until I was directed to research Biointensive growing (different than Biodynamic), pioneered by John Jevons (http://www.growbiointensive.org). The Biointensive method, although having some overlap with Permaculture principles, really stands out for it’s detailed research on starting seeds in flats and transplanting them efficiently into raised beds for maximum productivity. The main takeaways I got from John’s book, “How to Grow More Vegetables,” is that the most effective way to start seedlings is in flats (long, rectangular shallow trays) and that we should transplant them in a way that maximizes space. To illustrate these seemingly obvious principles, have you ever planted a tray of seeds according to the seed packet directions and are left over with half a packet or more? Or have you planted seeds that were small, broadcasted the seed around the tray and ended up with patches of intense growth that you have to separate (usually unsuccessfully) in order to tranplant? In Biointensive growing, you spend time to make sure the seeds are spaced evenly with minimal spacing. It’s quite normal to plant 180-300 seeds in one flat. The idea is to mimic nature, where seeds don’t naturally land in long spaced out rows. Seedlings don’t need a lot of space for root or leaf development, so most of the directions on seed packets are overly conservative and don’t affect the growth of the seeds (just the number of plants you can grow in one flat). Another tip I’ve found immensely helpful that I’ve picked up from the book is to plant the seeds as deep as their size. Most of us bury our seeds much too deeply; many seeds require light for germination so if they are buried too deep they’ll never end up germinating. This philosophy of maximizing space carries over into the garden when you transplant the seedlings outside. 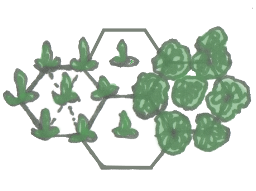 Instead of transplanting in rows, Biointensive recommendations are to plant using hexagonal spacing where the plants are close enough that their leaves will touch when they are at full size. In addition to allowing you to grow the most plants in the same space, the foliage as it develops will start to cover the bare exposed soil and greatly reduce the effects of evaporation. Some other tips from this treasure trove of helpful information are to make sure you harden off your transplants outside a few days before doing the transplant, pick wet days to do the transplanting to reduce plant shock, and make sure that half the root and stem structure goes underneath the soil when you perform the transplant. Since I started implementing biointensive techniques to start our seedlings, the stress of getting seeds into the garden has largely gone away. I still have difficulties starting certain perennial plants from seed but for most vegetables, flowers and herbs it’s a simple repeatable process that helps me to focus more on seasonal timings and harvests. 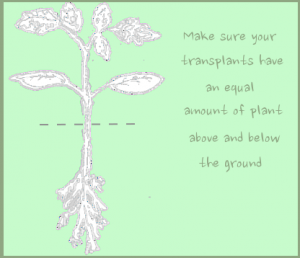 There are a few additional tips on transplanting I’d like to point out. 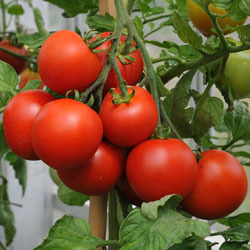 When you are transplanting a few tomato plants or squash, technique doesn’t matter that much because it only take a few minutes to bury the roots and these plants are quite good at adjusting to curling or bent roots. However, if you are planting leafy greens, it takes quite a few plants to produce a decent harvest and the roots are quite long and delicate. 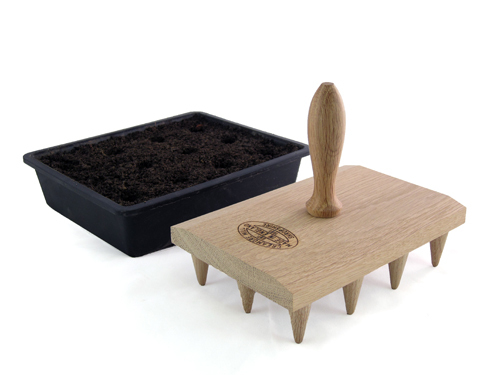 Transplanting a flat of 180 plants can easily take over an hour with a dibber (pictured above). A dibber is anything used to poke neat holes into which you would plop your transplant. However, I’ve discovered that using a straight-edge shovel plunged vertically into the plant line and then wedged over yields a big enough gap to quickly dangle in a half dozen seedling roots. I then remove the shovel and let the soil spring back without too much disturbance and pin the roots naturally with a little bit of patting to remove the shovel line. With this technique I can easily transplant a flat in about 30 minutes, which helps when you have a 2 year old son who loves to come along behind you and yank out the seedlings I just planted. I’ll be covering succession planting in my next article, talking about how to get 4+ crops a year in the same location and how to tie in your observance of the patterns in your space to plan your transplanting calendar. Please check out the Seed Starting checklist (which can be downloaded below). It summarizes information in this article and gives some links to good resources for further information.